Port Manatee takes Security very seriously. Facilitating the safe and secure movement of cargo and the protection of the port’s critical infrastructure is the highest priority. Since 9/11 security measures have been dramatically increased. To ensure a safe and secure environment for all employees and assets, the port has implemented strict access control procedures. The identity and business purpose of all persons entering the port display is verified before access is granted. 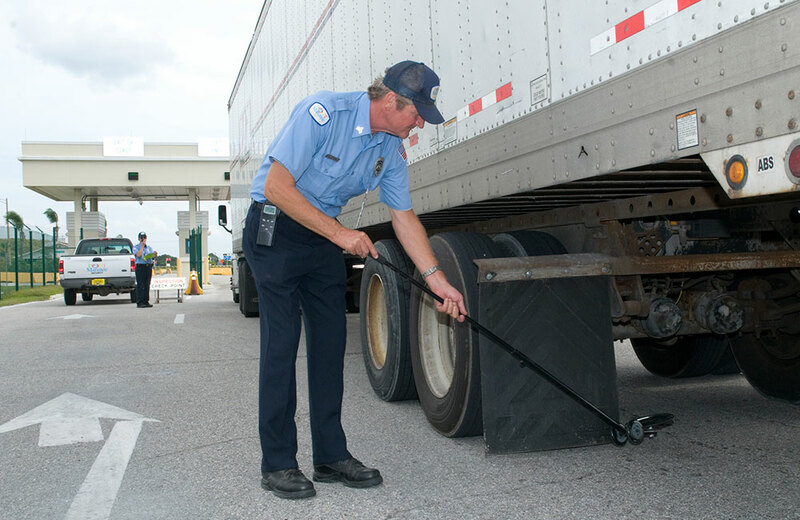 Port Manatee is fully compliant with the provisions of the Maritime Transportation Security Act (MTSA) and utilizes the federal Transportation Workers Identification Credential (TWIC) as the primary credential to initiate access control. Persons who possess a valid TWIC and are employed by port tenants or licensed operators may apply to enroll their TWIC into the port’s access control system. A $40 enrollment fee will apply. Demonstrate a verifiable business purpose to enter the port. This is accomplished by contacting the individual or business that is vetting access or by verifying tenant-issued load, pick-up or reservation numbers. Visitors not registered into the port’s electronic access control system who are not actively engaged in a commercial activity who require access to the administrative offices of the port or its tenant operators must receive a visitor pass prior to entering the port. Present a valid driver’s license or government issued photo identification card. Be listed as a visitor by a port or tenant employee authorized to receive visitors. Individuals will require monitoring as outlined in rule 411 at no cost. For more information on Port Manatee’s visitor and temporary Access policies and pricing, contact the Security Department at (941) 722-6455.